With markets in rebound mode today, the sellside's fascination with Wednesday's sharp, unexpected selloff continues. In the latest "hot take" on Wednesday's dramatic drop, Goldman's derivatives strategist Rocky Fishman takes on a different approach to the Wednesday rout, looking at it in terms of pre-event realized vol (of 6.4%), and notes that in this context, "Wednesday’s 3.3% SPX selloff naively represents an 8-standard deviation event, the 5th-largest tail event in the index’s 90-year history, as 6.4% annualized vol implies a 40bp one-standard deviation trading day; instead the drop was more than 330 bps. As Fishman adds, what makes the drop unique is that most of the top events of this severity, and listed in the chart above, "have often had a clear, dramatic, catalyst (1987 crash, Eisenhower heart attack, Korean war, large M&A event breakup)." Part of the reason this week's volatility looks like a tail event is that realized volatility had been surprisingly low prior to Wednesday: the five least-volatile quarters for the SPX over the past 20 years were Q1/2/3/4 of 2017, and Q3 of 2018. 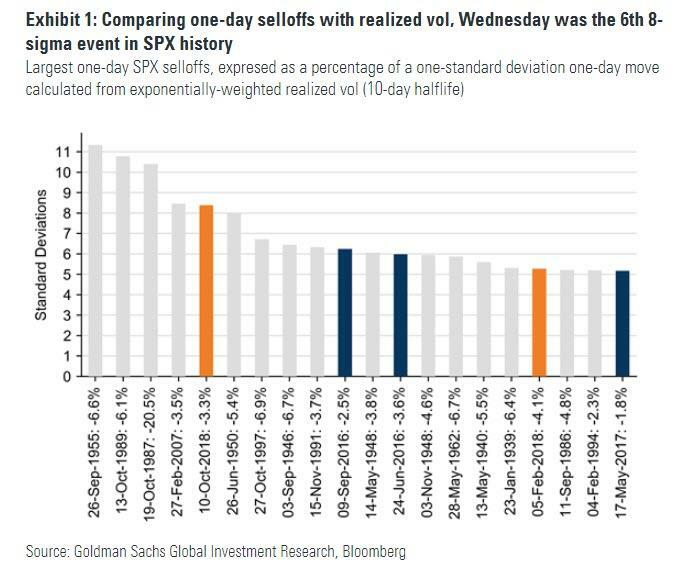 For Goldman, the Wednesday spike is reminiscent of the Feb. 27, 2007’s China-led selloff, "which marked the end of an extended low-vol period." That said, Fishman also notes that mathematical tail events have been more common recently, almost as if central bank tinkering with markets has broken them, To wit, "five of the top 20 one-day highest-standard deviation moves (comparing the SPX selloff with ex-ante realized vol) since 1929 have happened in 2016-8." 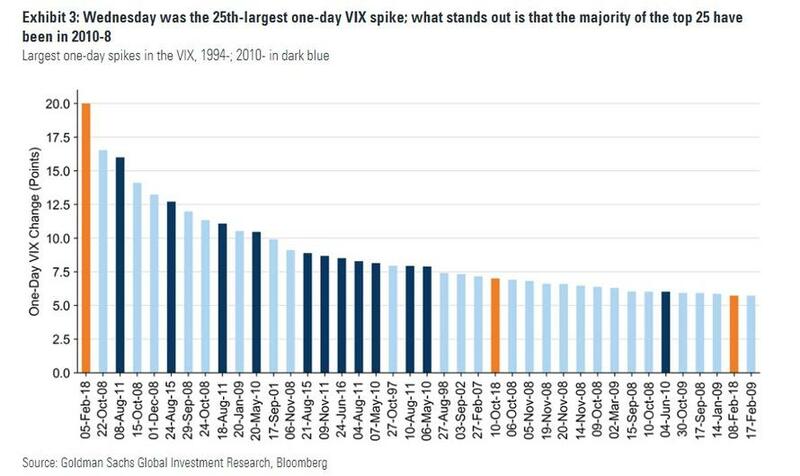 Fishman then shift focus to the VIX, which while not as violent as the February record spike, "was also the 25th-largest one-day VIX spike on record." Here, like above, what stands out again is the frequency of recent outlier events, which to Fishman are "a byproduct of risk aversion, liquidity conditions, and fleeting investor confidence." Specifically, after a year of record low vol in 2017, three of the 40 largest one-day VIX moves have happened this year, and 13 of the top 25 VIX move have happened in 2010-8. Breaking most of 2018’s trend, the VIX was at a nearly 10-point premium to one-month SPX realized vol at Tuesday’s close – indicating that markets were positioned defensively, and not lulled by unusually-low close-to-close volatility (intraday volatility had been somewhat elevated relative to close-to-close). Vol-of-vol implied by VIX options was surprisingly high in recent weeks and less surprisingly is even higher now. Perhaps as a result of this, volatility did not react to the sharp spot movements in an aggressive way: the beta of VIX futures to SPX futures, intraday, has been only somewhat above its recent normal level over the past few days, and has been well below the ETP-fueled beta seen in February. 26-Sep-1955 (SPX -6.6%, RV 9.0%): Eisenhower heart attack. News that President Eisenhower had suffered a heart attack in Colorado drove a sharp selloff. 13-Oct-1989 (SPX -6.1%, RV 9.0%): LBO failure. The United LBO failed, in a market already worried about recession risk. 19-Oct-1987 (SPX -20.5%, RV 31.0%): Market crash. The 1987 crash’s one-day move is one of the largest-ever tail events even though the previous week’s volatility had already pushed realized vol to a 13-year high. 27-Feb-2007 (SPX -3.5%, RV 6.5%): China selloff (FXI down 10%). While realized vol subsequently briefly dipped to the pre-event range, this largely marked the end of the 2004-6 low vol period. 10-Oct-2018 (SPX -3.3%, RV 6.5%): US growth and inflation scare. 26-Jun-1950 (SPX -5.4%, RV 10.7%): Korean war began. Looking at the above list, the Goldman strategist concludes that the 2007 event "stands out as being similar to Wednesday's event, because it happened at the end of an extremely low-vol period, and did not have a clear catalyst." Realized vol transitioned from the 10% in the 3-years prior to the selloff to the GFC-fueled 30% in the subsequent 3-years. This time, 3-year realized volatility had been 12% prior to Wednesday. And while Goldman does not foresee the severity of market downside as was experienced post-2007, "the similarity of this event with February 2007 is one data point suggesting a turning point for volatility" Fishman writes. The Goldman strategist's complacent mood aside, if indeed this is the start of a high-vol phase, it is worth reminding that the post-February 2007 period had a very unhappy ending for markets and the global economy. The frequency of mathematical tail events in the last few years makes it difficult to point to any one as the end of this historically low-vol period. February’s VIX spike would have been easy to point to, only to be proved wrong by Q3’s remarkably low volatility. That said, we will be watching 12-24 month implied vol for signs market participants are pricing in prolonged high volatility. In the meantime, option premia are high at current levels but market movement has been justifying these prices in the recent past. 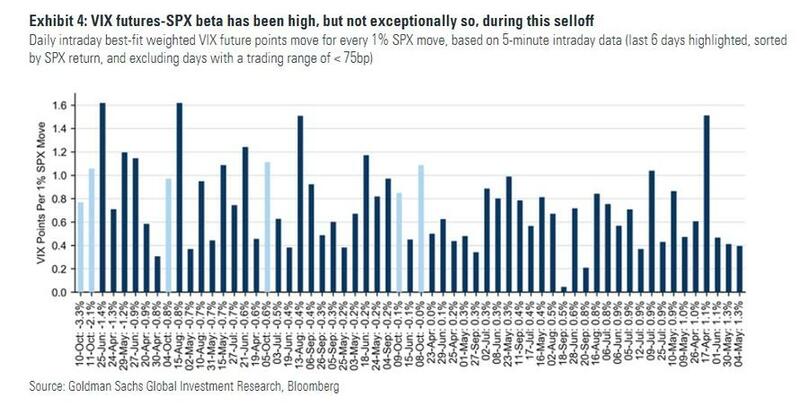 Finally, this is how Goldman is trading this low to high vol transition period: "We lean toward net-zero vega strategies, including 1x2 call spread overlays to add exposure to an SPX rebound, while evaluating the durability of this vol spike."